Learn to Fly! Access High-Tech Flight Training Aircraft, Flight Instructors, and a Webbased Flight-Training System. Clear online Ground School and Flight Preview videos. Learn to Fly in the Bay Area! Pilot license training. The flying club is open to the public. Learning to fly, the ability to fly, is more than a useful skill and an engaging pastime. It is in the most fundamental sense a liberation from the ground. The extent to which this is true is difficult to communicate to those who have not already experienced it. .
A pilot’s license changes people’s entire definition of who they are, of where they live. And where they may easily go. It provides a shift in geographic perspective of the deepest order. In the most concrete terms, it means that from the San Francisco Bay Area you can get anywhere in the Western United States in a simple morning’s flight. 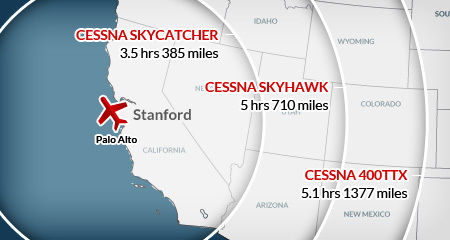 Stanford Flying Club in Palo Alto is a network of people in the S.F. Bay Area who have joined together — To make and have all this possible and affordable. . Obtaining your Pilot-License will provide you the opportunity to look around not just the Bay Area, but far beyond. Aerial views can provide perspectives and details that few share and no one forgets. Added lifestyle options from learning to fly bring new rewards. Flying Lessons and earning a pilot license, provide the freedom to travel and save time. And, benefits that are unique and valuable. .